You thought that Swiss watches only had diamonds. How about watches with inaccessible materials like moon dust, parts of the Apollo 11 rocket and bits of spacesuits? 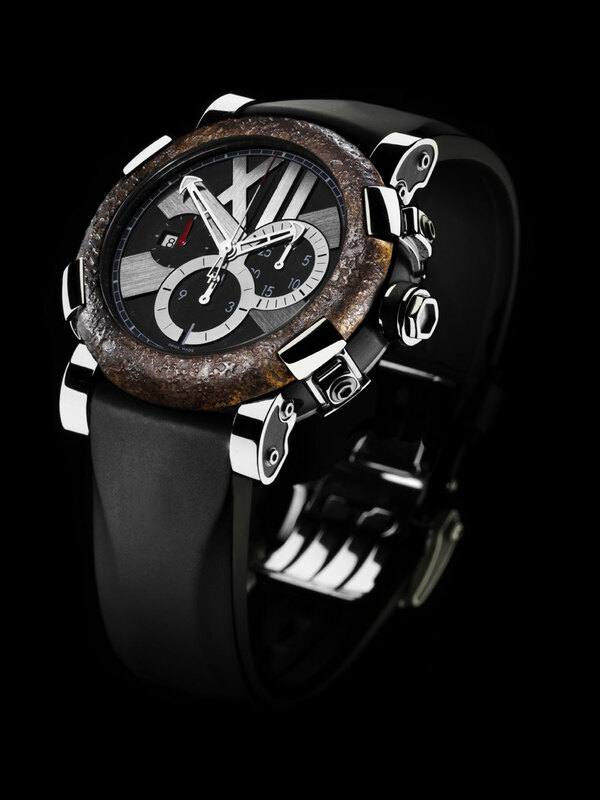 Romain Jerome has done it or plans to do it. The Swiss brand now comes with “Titanic DNA” watches, made from steel and coal from the ocean liner that sank on its maiden voyage in 1912, which is now available in India. Called Titanic-DNA rusted steel T-oxy III Chronograph, this model is equipped with a new movement developed by Concepto for RJ, the “C21RJ21”. 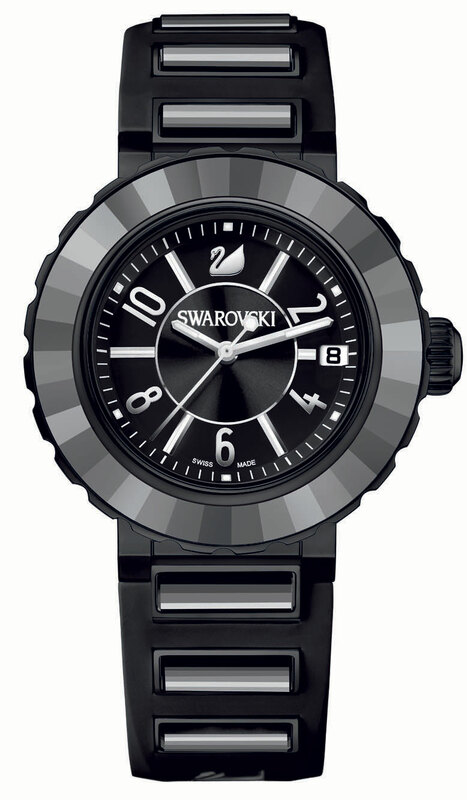 This movement discovers variants of slate-gray and black and is equipped with a navy anchor as the oscillating weight. With a diameter of 50mm – 53mm including the screw-in crown – it features articulated horns and push buttons which blend perfectly with the design of Titanic-DNA timepieces, integrating the characteristic transverse paws. The dial architecture is constructed on different levels, overlaying matt velvet finish for the back, a satin finish for the famous transverse cross and the Roman numeral XII, snailed counters, and numerous variations of black, with texture and hues obtained by vapourising charcoal dust from the wreck itself. The oxidised steel bezel is the result of an extraordinary blend of authentic steel from the wreck lying 3840 meters under the sea, and from the Harland & Wolff shipyard in Belfast, where the Titanic was constructed nearly a century ago. French professional basketball player Tony Parker has joined the Tissot ambassador team. The captain of the French national basketball team and NBA’s San Antonio Spurs player scores highly on the international scene for his energy, apparent fearlessness and strong sense of social responsibility. As Official Timekeeper of FIBA (International Basketball Federation), Tissot visibly shares the new ambassador’s dedication to performance and looks forward to a winning partnership. Tony Parker has enjoyed an impressive career to date. His success with the French national team, which he led to a bronze medal in the 2005 European Championships, parallels an outstanding NBA track record. He has a trio of NBA Champion titles to his name from 2003, 2005 and 2007 and has been an NBA All Star on three occasions. In 2007 he was honoured as the MVP (Most Valuable Player) in the NBA finals, the first foreign-born player to do so. At the contract signing, Tissot President François Thiébaud commented, “His natural talent and focused determination are deeply impressive and our partnership will help spread his inspirational qualities around the world. The Tissot involvement in basketball also appears destined to grow at a rapid date. Already in 2009, the first year of collaboration with FIBA, the Swiss brand was entrusted with the timekeeping and data handling for EuroBasket in Poland. Building on its success in this role, Tissot this year has been honoured with the same responsible role at the 2010 FIBA World Championship for men in Turkey (August 28–September 12), and for women in the Czech Republic (September 23–October 3). Swarovski “Octea” line has played a considerable part in the collection’s success to date. Now it offers three new colour variations—orange, red and black. “Octea Sport” in orange unites dynamic colouring, timeless design and an impeccable watch mechanism. At the same time, it offers all the features that brought its predecessor worldwide acclaim. The unidirectional rotating bezel is made entirely of faceted crystal and represents a significant technical achievement. This time it is exclusively clear crystal, with highlights provided by an eye-catching orange scale divided into minutes. Beneath the anti-reflective sapphire crystal, the luminescent hands and central second hand pass orange hand-applied indexes and Arabic numerals. The aperture for the date indicator is positioned at 3 o’clock, close to the Swan that replaces the 12. The sophisticated dial combines matt grey and sunray silver grey finishes, while the notched crown, which features a cabochon covering the Swan motif, completes the steel 39-mm case that houses the watch’s Swiss made ETA movement. 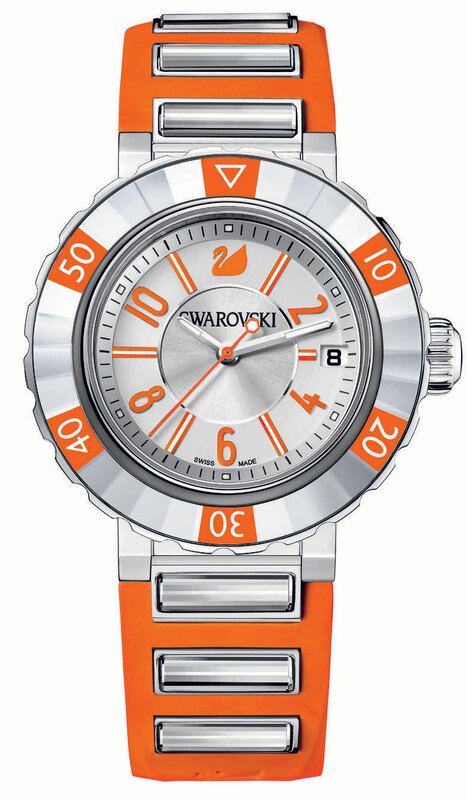 Complementing the sunray cut crystal of the bezel, six clear crystals punctuate the vibrant orange of the rubber strap at regular intervals, each of the crystal highlights is set and screwed down with the greatest craftsmanship. The faceted horns and ardillon buckle, as well as the case engraved with the Swanflower™ motif make this model unique and instantly recognisable. The other “Octea Sport” models – in red and black – offer the same watchmaking finesse, with a clear crystal and red or entirely Jet Hematite crystal bezel. A red or black dial beautifully sets off the silver hand-applied indexes, and the black version offers black PVD Arabic numerals and logo. The pieces are completed with six clear crystals on a red rubber strap, and by tone-on-tone Jet Hematite crystals on a black strap, creating an incredibly elegant effect. Price Rs. 38,500. Hermann Grieb—watchmaking genius and one of the three partners comprising GRIEB & BENZINGER—has conjured up a masterpiece of watchmaking: a rare Minerva column wheel chronograph movement estimated to be from about 1925. 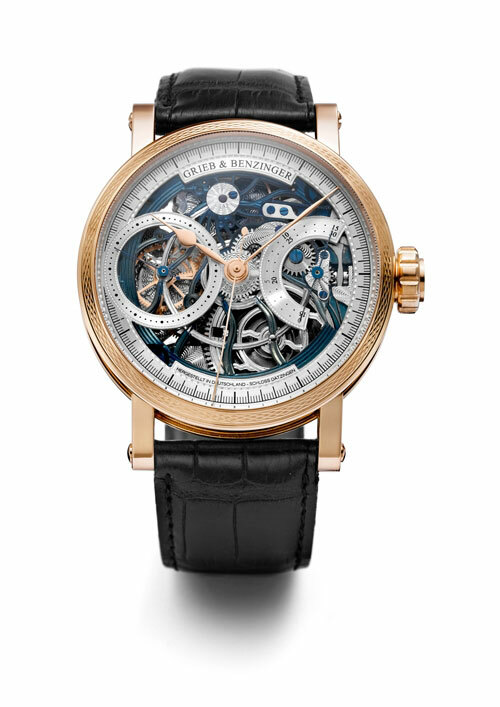 After countless hours of total restoration, hand skeletonization, hand-engraving and guilloche, the vintage base Minerva movement awakens to new life to become a characteristic new horological piece of art in typical GRIEB & BENZINGER style: the 18-karat gold monopusher skeletonized chronograph christened The Blue Wave. The company’s typical blue platinum coating of the base plate has also found its way into the new unique piece. The base plate was first hand-skeletonized to its barest minimum in characteristic wave style and the case back hand-guilloche. All 34 steel screws were polished by hand and classically tempered a cornflower blue over an open flame. Today, steel screws are generally blued by use of galvanic coating. In its heyday, Minerva was one of the finest and best chronograph makers in the world. Chronographs had already been in existence since around 1800, however Minerva was one of the first chronograph makers to incorporate a minute counter. Minerva named its company after the Roman goddess Minerva. Traces of this Roman deity can be found again and again in fine watchmaking—even A. Lange & Sohne has immortalized various depictions of the goddess as a motif or symbol on its most exclusive pocket watch cases. The Blue Wave is one-of-a-kind-watch and there will only be one lucky timepiece enthusiast worldwide to have the pleasure of wearing this exclusive watch on his or her wrist. Price: (€ 87,500). Available at Georg Bartkowiak, T: +49-7231-983000 (office)& +49-171-4426903. New Constellation, a stunning new collection of watches from Omega reinforces its commitment of combining the best designs with the most innovative technology – this range presents a mix of sleek and strong looks. At the heart of the launch lies its promise of design superiority and exclusivity. In addition to traditional designs, the New Constellation offers to consumers contemporary yet dressy designs. The women’s design introduces leather straps for the first time in the Constellation range. 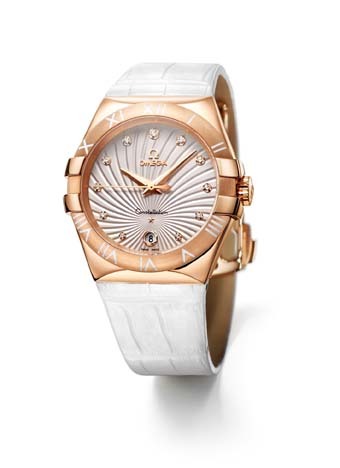 The white Constellation Ladies timepiece with a polished 18 Ct red gold case and a white alligator leather strap is an ideal accessory for any stylish wardrobe. Its dramatic brushed 18 Ct red gold bezel features Roman numerals, are coated with white Super-LumiNova. 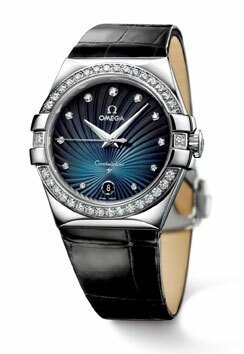 The silver lacquered dial features a supernova pattern which explodes from the Constellation star. Price: Rs 3, 47,000. Adorned with the 34 full-cut diamonds, a black alligator leather strap and a shaded grey dial makes this striking watch a unique creation. The polished facetted hour and minute hands are coated with white Super-LumiNova, which makes it easy to read in all light conditions. Price: Rs 5, 29,000. Celebrating the spirit of togetherness, the new ‘Soul Mates’ collection from Milleret is a tribute to love. Ideal for couples, the range comes with matching designs. 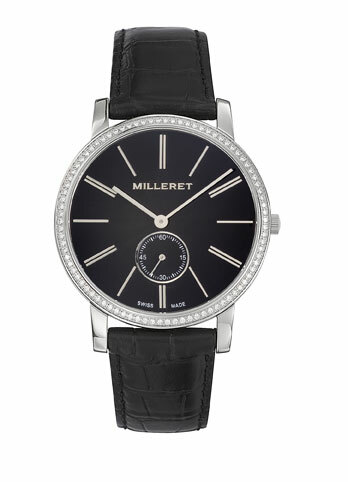 Diamond encrusted classic dials ensures glamorous sophistication which is hard to resist. Vacheron Constantin’s Overseas collection dedicated to travel as its name implies is based around three best-sellers – Overseas Self-Winding, Overseas Chronograph and Overseas Dual Time – available in steel, gold and steel/titanium versions. 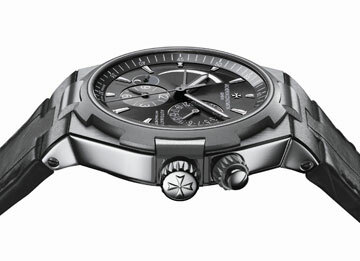 It is now rounding off the Dual Time range by introducing a steel with a titanium bezel variation. The Overseas Dual Time Self-Winding Steel and Titanium is both resolutely sporty and elegantly distinguished. It adjusts smoothly to all kinds of situations, whether on golfing greens, at sea, in the mountains or during chic evening occasions. The elegant design of this model is adorned with subtle shades of grey created by the steel base, the titanium bezel and the slate grey dial. Grey reigns supreme and unrivalled on this new model reflecting the signature features. These include sleek lines, a generous 42 mm diameter, a titanium bezel with a cut-out inspired by the Maltese Cross, water resistance to 15 bar equivalent to a depth of 150 metres, along with the emblematic Overseas motif depicting a two-masted sailboat engraved on the solid case-back. You are currently browsing the watchalive weblog archives for September 2010.